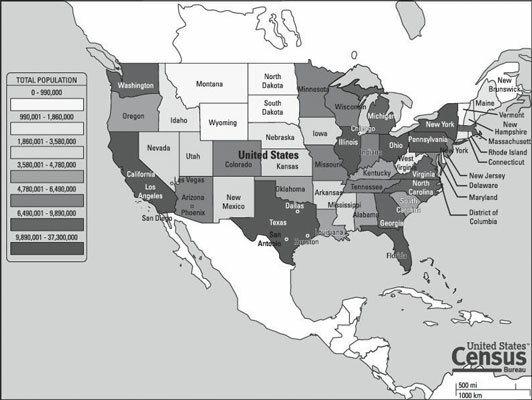 One half of the question-answer portion of the GED Social Studies test is based on maps, graphs, tables, political cartoons, diagrams, photographs, and artistic works. Some items combine visual material and text. You need to be prepared to deal with all of these types of items. Maps aren’t there only to show you the location of places. They also give you information, and knowing how to decode that information is essential. A map may show you where Charleston is located, but it can also show you how the land around Charleston is used, what the climate in the area is, and whether the population there is growing or declining. Start by examining the print information with the map, the legend, title, and key to the colors or symbols on the map. Then look at what the question requires you to find. Now you can find that information quickly by relating the answer choices to what the map shows. Indirectly, the map also shows you much more. It allows you to compare the population of states with a quick glance. For example, you can see that Florida has a larger population than Montana, North Dakota, South Dakota, and Wyoming together. If you were asked what the relationship is between a state’s size and population, you could argue, based on this map, that there isn’t much relationship. You could also show that the states around Lakes Erie and Ontario have a higher population density than the states in the Midwest. This is part of the skill of analyzing maps. Every time you turn around, someone in the media is trying to make a point with a graph. These types of graphs are very typical examples. The real reason people use graphs to explain themselves so often is because a graph can clearly show trends and relationships between different sets of information. These three graphs are best suited for a particular use. For example, the bar graphs are great for comparing items over time, the line graphs show changes over time, and the pie chart shows you proportions. The next time you see a graph, study it. Be sure to look carefully at the scale of graphs; even visual information can fool you. A bar graph that shows a rapid rise of something may in fact show no such thing. It only looks that way because the bottom of the chart doesn’t start with values of zero. Check carefully to make sure you understand what the information in the graph is telling you. Tables are everywhere. If you’ve ever looked at the nutrition label on a food product, you’ve read a table. Study any table you can find. 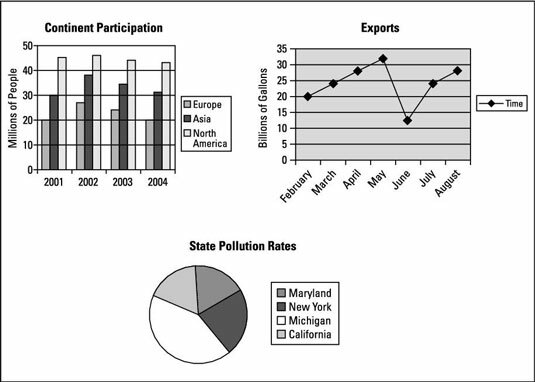 The population data table is an example of the kinds of data you may see on the test. That table shows you a lot of information, but you can extract quite a bit more information that isn’t stated. Just a quick look at the numbers tells you that nearly 1.6 million people are enlisted in the Armed Forces. How do you know that? Subtract the number in the Civilian Population column from the Resident Population Plus Armed Forces Overseas column. You can also calculate tons of other great information. Political cartoons appear in the newspapers every day. If you don’t read political cartoons in the daily newspaper, give them a try. If you want to get the most out of political cartoons, look for small details, facial expressions, and background clues. The cartoons on the test are obviously older than the ones in daily newspapers, so you may not get the context. You’ve no doubt seen countless photographs in your day. Photos are all around you. All you need to do to prepare for the photograph-based questions on the test is to begin getting information from the photographs you see. Start with the newspapers or magazines. See whether you can determine what message the photograph carries with it and how it relates to the story it supports. You probably like to look at works of art. On the Social Studies test, you have a chance to “read” works of art. You look at a work of art and gather information you can use to answer the item. To get yourself ready to gather information from works of art on the test, take a look at art galleries, the Internet, and library books. If you’re unsure of how to read a map, go to any search engine and search for “map reading help” to find sites that explain how to read a map. If any of the other types of visual materials cause you concern, do the same thing — with the exception of political cartoons. Instead, look at some examples of political cartoons to try to understand what the cartoonist is saying to you. Then look up the topic of the cartoon and the date to read some of the news stories it refers to. Talk about the cartoon with your friends. If you can explain a cartoon or carry on a logical discussion about the topic, you probably understand its contents. All the visual items you have to review on this test are familiar. Now all you have to do is practice until your skills in reading and understanding them increase. Then you, too, can discuss the latest political cartoon or pontificate about a work of art.